Leo Gallery is delighted to present Sutthirat Supaparinya + Yuan Keru Duo Exhibition in Shanghai in May 2017. The exhibition runs from May 21 till July 22. And presents diversified artworks from 2 contemporary young women artists including videos and photographs : Sutthirat Supaparinya from Thailand, Yuan Keru from China. Sutthirat Supaparinya’s two video projects: Roundabout at km 0 and Unintentionally Waiting. Roundabout at km 0 portrays the pausing and reversing travel around a roundabout through moving images. Unintentionally Waiting uses moving images and photographs to show how local governments struggle to facilitate services to the public. 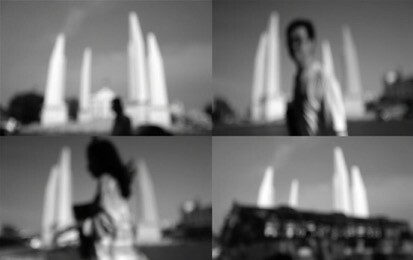 Sutthirat Supaparinya is a video and installation artist. By means of her works, she questions the interpretation of images in the media, showing an impact and the relationship of personal and life experiences to a larger structure. Yuan Keru’s project: Fleeting Strangers. This video virtualizes 4 parallel worlds, and tells 4 soft sci-fi stories that happen at different times each in different ways. Yuan Keru is a visual artist and a filmmaker. Her artistic creation focuses on exploring the sense of painting, spatial rhythm and narratives of video, combining the on-going events, emotions with history, mythology, dreams and so on. By drafting novels, breaking up the text structure, setting costume scenes and preparing semi-improvised performances and conversations, she endows video with senses of cinema and glamours of drama. The Sutthirat Supaparinya + Yuan Keru Duo Exhibition is the World premiere of the newest artworks by two artists.